Hello everyone! I'm posting over at Twine It Up! 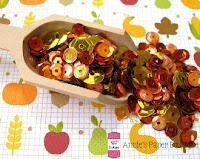 with Trendy Twine today using the fun, new Annie's Paper Boutique Hello Fall Planner Stamp Set. They are so super cute! 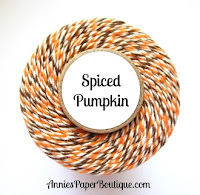 These are perfect for Fall and Thanksgiving and you don't just have to use them in your planner! So I made a Happy Thanksgiving card to show you. I stamped all four image stamps along the row of my paper and colored them in with my Zig Watercolor markers. Then I lined up the Happy and Thanksgiving along the top. 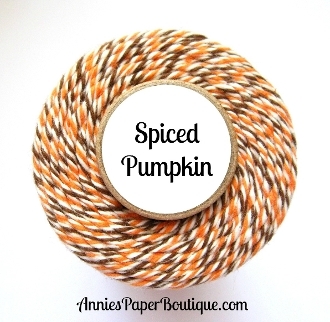 I also used some of the yummy new Spiced Pumpkin Trendy Twine and a few sequins from the Autumn Sequin mix you can find in the store. The pattern paper is from DCWV that matched one of the stamps pretty well so I just had to use it on this card. The top layer is mounted with some foam tape. Make sure to get a set of these fun stamps from Annie's Paper Boutique in time for Thanksgiving!! Super cute Helen! Love the paper! Your card is so super ADORABLE Helen!!! Love those CUTIE stamps!!! Very cute card! The stamps coordinate perfectly with the background paper, it looks awesome!